Discover a wide variety of practical cases and real world techniques to enhance your productivity with Clojure. This book is for Clojure developers who have some Clojure programming experience and are well aware of their shortcomings. If you want to learn to tackle common problems, become an expert, and develop a solid skill set, then this book is for you. When it comes to learning and using a new language you need an effective guide to be by your side when things get rough. For Clojure developers, these recipes have everything you need to take on everything this language offers. This book is divided into three high impact sections. The first section gives you an introduction to live programming and best practices. We show you how to interact with your connections by manipulating, transforming, and merging collections. You&apos;ll learn how to work with macros, protocols, multi-methods, and transducers. We&apos;ll also teach you how to work with languages such as Java, and Scala. The next section deals with intermediate-level content and enhances your Clojure skills, here we&apos;ll teach you concurrency programming with Clojure for high performance. We will provide you with advanced best practices, tips on Clojure programming, and show you how to work with Clojure while developing applications. In the final section you will learn how to test, deploy and analyze websocket behavior when your app is deployed in the cloud. Finally, we will take you through DevOps. 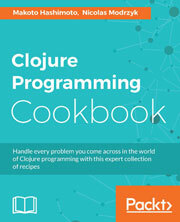 Developing with Clojure has never been easier with these recipes by your side! This book takes a recipe-based approach by diving directly into helpful programming concepts. It will give you a foolproof approach to programming and teach you how to deal with problems that may arise while working with Clojure. The book is divided into three sections giving you the freedom skip to the section of your choice depending on the problem faced.